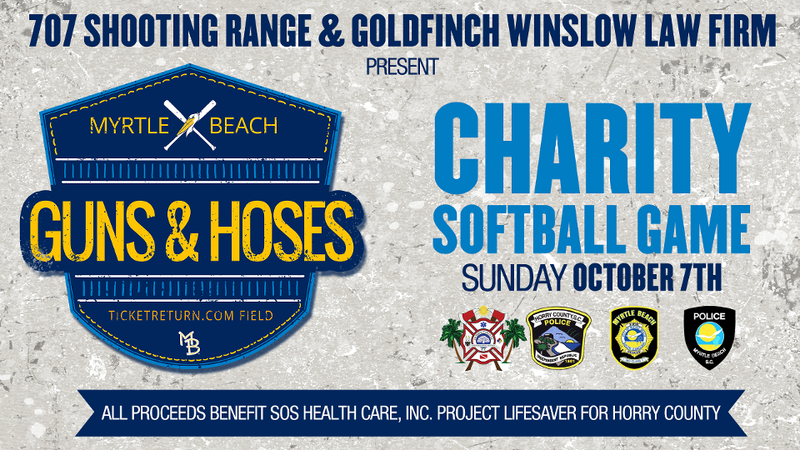 MYRTLE BEACH, S.C. (September 6, 2018) - The 11th Annual Guns & Hoses Charity Softball Game will take place at TicketReturn.Com Field at Pelicans Ballpark on Sunday, October 7. The event, presented by 707 Shooting Range and Goldfinch Winslow Law Firm, features a 4-team showdown between Myrtle Beach and Horry County first responders. All proceeds from the event will benefit SOS Health Care, Inc. Project Lifesaver for Horry County. "This is a great, friendly rivalry game between the police and fire departments," said Project Lifesaver Program Coordinator Monique Clement. "Without their support Project Lifesaver would not be possible in our area. They are our first responders, our search and rescue, and the backbone to Project Lifesaver." "After teaming up with the Myrtle Beach Pelicans in 2017 this event drew its biggest crowd to date," added Clement. "The Pelicans have stepped up to the plate again this year and I have no doubt it will be bigger and better than before, allowing SOS Health Care to make Project Lifesaver more successful." Admission to the event is a $5 donation to SOS Health Care, Inc. The event will also include a hot dog buffet while supplies last. Concessions will also be available. Additionally, spectators can participate in various games and raffles with all proceeds benefiting SOS Health Care Inc.
"We're excited to host this event for a second straight year," stated Pelicans General Manager Ryan Moore. "TicketReturn.Com Field is the community's ballpark and what better way to celebrate that than by hosting a charity event headlined by our community's first responders." Event details are available online at myrtlebeachpelicans.com/guns&hoses. ABOUT SOS HEALTH CARE, INC: The mission of SOS Health Care, Inc. is to partner and inform the community by providing hope, care and assistance to individuals with Autism and Intellectual Disabilities. Their vision is to be an organization that is proactive and always moving forward. It creates its own future, is results focused, and seeks to achieve impact that adds value to a large group of stakeholders. It honors traditions but values change which it sees as a necessary part of an evolving world. Internally, development is almost sacred. People routinely exchange resources and share new ideas. Everyone is connected internally and externally. "What ifs" and "what's out there" are considered normal parts of conversation. ABOUT PROJECT LIFESAVER: The primary mission of Project Lifesaver is to provide timely response to save lives and reduce potential injury for adults and children who wander due to Alzheimer's, autism and related conditions. This is a program that uses radio telemetry to track individual transmitters on a band worn like a watch or a bracelet. The transmitter is assigned a frequency that can be used to track down the wearer should he or she leave home without the knowledge of their caregiver. Project Lifesaver currently is a partnership program between SOS Health Care and Horry County Public Safety and currently covers 32 children with autism. The cost of the band and batteries for one year is $375 per year. Project Lifesaver provides this service free of charge to the individual. ABOUT THE PELICANS: The Myrtle Beach Pelicans are the Class A-Advanced affiliate of the Chicago Cubs and play their home games at TicketReturn.Com Field at Pelicans Ballpark in Myrtle Beach, South Carolina. Since being acquired by a group led by Chuck Greenberg during the 2006 season, the Pelicans have repeatedly set team attendance records and become known as one of Minor League Baseball's most innovative and creative franchises. The team and its employees have been dedicated to making a difference in the Myrtle Beach community, specifically giving back over $2 million in donations, fundraising proceeds, in-kind services and community service since launching the Pelicans Play It Forward Community Initiative in 2013. TicketReturn.Com Field at Pelicans Ballpark has ranked in the top eight in all of Minor League Baseball by Stadium Journey in six of the last seven seasons. The same publication also placed the Pelicans in the Top 100 Stadium Experiences and the best in the Carolina League for six of the past seven seasons. In June 2017, the Pelicans won the 2017 TripAdvisor.com Certificate of Excellence award. For more information on the Myrtle Beach Pelicans, please contact the Pelicans at (843) 918-6000 or email Info@MyrtleBeachPelicans.com.